One of our favorite burgers in LA was in the rotation for another look. Wolfgang's Steakhouse had been both a hit and a miss last year. Fat Bruce Lee, ChiBurger, and I wanted to see how things were, burgerwise, this year. Things were phenomenally good, my friends! This was the Wolfgang's that we fell in gustatory love with last year. We snacked on the warm bread that arrived prior to our meals and waited about 10 minutes for our trio of $13.95 cheeseburgers with onion rings and fries to arrive...it was love at first bite. 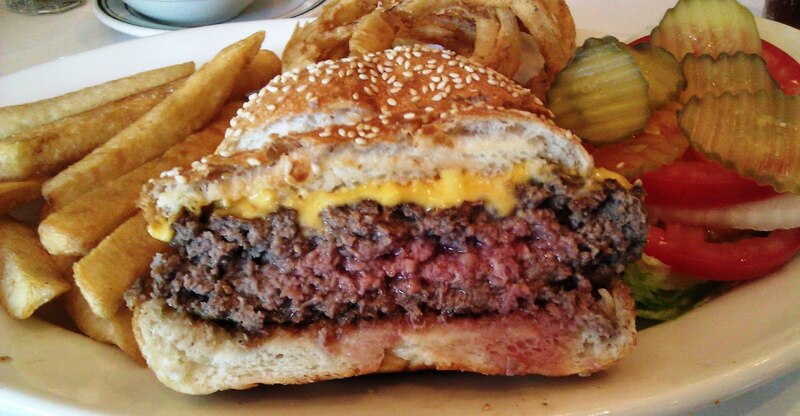 The Beef: At Wolfgang's Steakhouse, Sirloin was only thing in the burger blend. This Sirloin was dry-aged in an on-site, salt-tiled locker. The beef was ground fresh daily. This was a crime scene of a burger. It was remarkably juicy, rich, beefy, and it was dense with complex steak and mineral flavors from the Sirloin and blood. A mild, aged funk carried throughout the entire bite. This was likely due to them cutting aged steak fat into the grind. The beef was utterly delicious. It was a tender steak on a bun. The Seasoning: The salty seasoning on the exterior of the half pound burger patties was just right. The seasoning enhanced the natural deliciousness of the Sirloin without drawing attention away from the juicy beef. The Sear: I requested that they cook the patties on the hottest part of the griddle/flat-top so that our burgers would receive a good sear. Chef Cid obliged this request, and our burgers came out with a crisp sear. The sear was flavorful, and it served to amplify the flavors and textures of the terrific beef. The Preparation: The Sirloin was ground fresh daily to Medium Coarse. 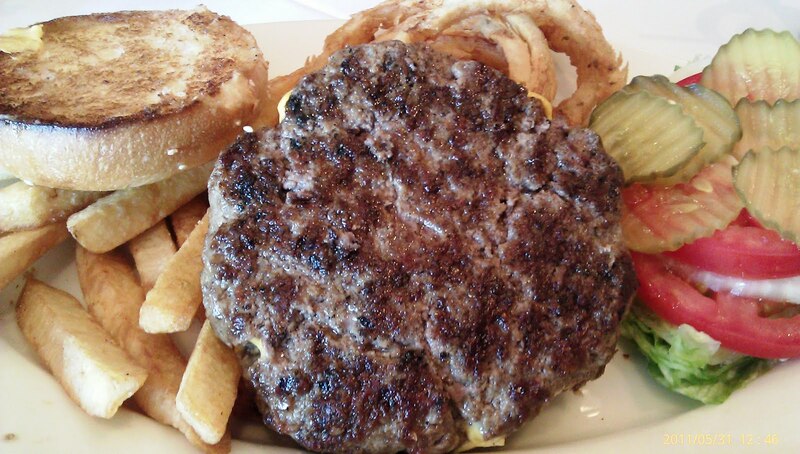 The ground steak was then left alone until a burger was ordered. The beef was then formed into thick patties and griddled to the desired cooking temperature. We all ordered Med-Rare, and that is what we received. There was absolutely nothing wrong with this burger. It was also massive. The patty weighed in somewhere around 10 ounces. The Cheese: The burger did not need cheese, but I had mine with a slice of American, and the melted cheese provided a wonderful addition to the firm mouth feel provided by the beef. The cheese got it to extra-delicious. The Bun: The BreadBar bun was chewy, moist, and fresh. This was a seeded, standard hamburger bun. It was nicely toasted, so that it provided a little crunch to complement the moist beef. The bottom bun competently soaked up the copious juices. The Meat To Bun Ratio: In spite of the daunting size of the burger and the fact that the meat overlapped the sides of the bun, the meat to bun ratio was dead on. It just worked. The Fries And Rings: The thick, long steakhouse fries were earthy and well-crisped even though they were 1/3 inch rather than the standard 1/4 inch in thickness. The white onion, hand-breaded rings were sweet and crisp. Both the fries and the rings were perfectly seasoned. The Toppings: The tomato slices were wonderfully ripe and bursting with hearty tomato flavor. The slab of iceberg lettuce was fresh and crisp. The Value: It was about 14 bucks for two meals worth of delicious cheeseburger. I brought half of mine back to the world headquarters, and it was devoured by one of the minions....he pronounced it to be amazing. Chi Burger ate his second half within an hour of the first. Wolfgang's Steakhouse served up a burger, which you should not miss out on. It was truly perfect. It was a clean, honest, no-frills, steakhouse burger, which was perfectly executed and perfectly delicious--it was a masterpiece. When our waiter asked if we would like to see the dessert menu, Fat Bruce Lee replied, "We already had dessert." He was right. I would caution anyone wishing to try this fantastic dish to call ahead to make certain that Chef Cid Gonzalez is on hand...on both occasions where Chef Cid has prepared my burger, it has been a knockout. Burger Review : GO TO WOLFGANG'S STEAKHOUSE...do it soon. The burger was amazing. This was one of the best burgers in LA in terms of flavor, quality, and preparation.